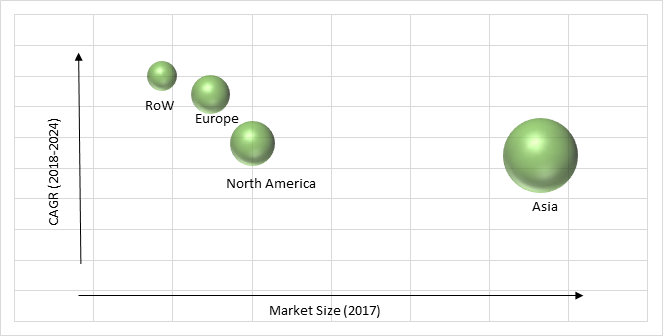 The global electric motor market is expected to grow at a CAGR of 5.9% with its market size attaining a value of USD 145.3 billion by 2024. Electric motors are electro-automated procedures that perform operations on the basis of electromagnetic induction since they are extensively efficient and durable. Furthermore, these devices entail low maintenance, have high resolution for shifting voltages. The growth of electric motor market is attributed towards low cost of electric motors as compared to that of fossil-fuel engine as a result of which these systems are witnessing greater utilization in varied industry domains such as oil & gas and automotive domain. On the basis of motor type, the global electric motor market is segmented into DC motor, AC motor and hermetic motor. Among these segments, AC motor has been contributing largest revenue throughout the estimated period. The growth of this segment is attributed towards increasing adoption of various industries for instance cement, paper & pulp and chemicals and wastewater treatment thereby strengthening the growth of electric motor market across the globe. Based upon output power, the global electric motor market is categorized into integral horsepower output and fractional horsepower output. Fractional horsepower electric motor has been contributing larger revenue throughout the estimated period. The growth of this segment is attributed towards increasing demand for low power applications of household applications, HVAC equipment and transportation domain and motors used specifically in motor vehicles. On the basis of application, the global electric motor market is segmented into industrial machinery, motor vehicles, transportation, household appliances and others. Motor vehicles are witnessing significant demand for electric motors, due to the increasing demand for electric vehicles among different developing countries. Increasing compliance for energy efficient electric motors are the key driving factors pertaining towards the growth of electric motor market across the globe. Electric vehicles help in reducing the contamination in air and helps in stabilizing the problem related to crude oil prices. Moreover, apart from involving high initial set up cost the electric vehicles enables reduced working cost for the users that is further strengthening its demand worldwide. Additionally, several countries are embedding their focus upon long haul scenario and cost savings benefit. Moreover, increasing demand for commercial and residential sector is another factor that is driving the growth of global electric motor market. The ever increasing population of developing countries and increasing disposable income of citizens has exaggerated the construction of various business structures, malls, private buildings, plants and industrial facilities. Furthermore, with wide variety uses and application of these system electric motor market is growing at exponential rate across the globe. The high set up cost of the energy efficient electric motors is expected to hinder the growth of global electric motor market since the producing process associated with electric motors is complex and the cost pertaining to assembling and manufacturing is quiet high. Globally industry players are leveraging market growth by enhancing the quality and reliability of their offerings along with maintenance of a widespread distribution network that will ensure increase in demand for their products. The key players across the globe are adopting various strategies such as mergers and acquisitions that help in strengthening and expanding their market base. In 2017 in order to diversify its product line Nidec Corporation had acquired motors, drives and power generation business of Emerson Electric Co.
Geographically, electric motor market in Asia-Pacific is the largest electric motor market. The key factor behind the largest share of the region is extensive acceptance of these systems in both passengers and commercial car segment in this region, accentuating growth in the construction and manufacturing domain in various developing countries of this region. For instance, the make in India initiative introduced by the government of India in 2014 with an objective to create India into a manufacturing hub that is further strengthening the domestic manufacturing activities in the country that is thereby fueling the growth of electric motor market in Asia-Pacific. The market structure of electric motor market is consolidated structure and the key players operating in the global electric motor market includes Johnson Electric Holdings Limited, AMETEK, Inc., Franklin Electric Co., Inc., ASMO Co., Ltd., Denso Corporation, Robert Bosch GmbH, SL Montevideo Technology, Inc., Siemens AG, ABB LTd. and ARC Systems, Inc.
10.3. Franklin Electric Co., Inc.
10.7. SL Montevideo Technology, Inc.
Table 141 Snapshot – AMETEK, Inc.
Table 142 Snapshot – Franklin Electric Co., Inc.
Table 143 Snapshot – ASMO Co. Ltd.
Table 146 Snapshot – SL Montevideo Technology, Inc.
Table 148 Snapshot – ABB Ltd.
Table 149 Snapshot – ARC Systems, Inc.